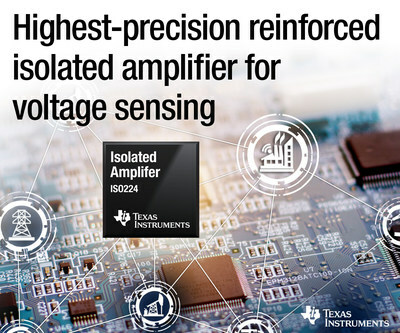 DALLAS, Oct. 1, 2018 /PRNewswire/ -- Texas Instruments (TI) (NASDAQ: TXN) today introduced a new reinforced isolated amplifier that features the industry’s highest precision and working voltages, and longest lifetime reliability. With exceptional performance that includes better nonlinearity, lower offset and gain error, and higher temperature stability, the ISO224 allows engineers to overcome performance limitations and design high-precision systems. The new amplifier is designed for isolated voltage sensing in factory automation and control, grid infrastructure, rail transport and motor drive applications. For more information, see http://www.TI.com/ISO224-pr. Highest reliability: TI’s capacitive isolation technology enables the longest lifetimes and 50 percent higher working voltages than required by isolation industry standards, common-mode transient immunity (CMTI) of up to 80 kV/µs and robust operation over an extended industrial temperature range of -55°C to +125°C. Industry’s highest performance: The high-precision ISO224 enables more accurate measurements of ±10-V signals, which are widely used in industrial applications, with 25 percent better nonlinearity, eight times lower gain error, lower offset drift and faster system response than similar competitive devices. Small size: Engineers can reduce board space with the ISO224’s 60 percent smaller package than the previous-generation ISO12x amplifiers as well as its output that supports direct connection to an analog-to-digital converter with 5-V input. The ISO224 also features a single, high-side supply with integrated voltage detection that simplifies the design and system-level diagnostics. Designers can download the TINA-TI™ SPICE model and then simulate and analyze their circuit behavior with the ISO224 isolated amplifier by downloading the SIM TINA-TI reference design, the ISO224 TINA-TI SPICE model, or by using the ISO224 evaluation module. Preproduction samples of the ISO224 are available now through the TI store. The ISO224 is available in an 8-pin, 5.85-mm-by-7.5-mm small-outline integrated circuit (SOIC) package. Pricing starts at US$6.49. The ISO224 joins TI’s portfolio of low-power reinforced isolated amplifiers that allows engineers to extend the lifespan of their high-voltage systems. Learn more about TI’s quality and reliability, and review the range of certifications such as VDE, CSA and UL, in the isolated amplifier overview. Additional technical information about TI’s isolation technology, which enables the industry’s highest isolation ratings and longest lifetime reliability, is available at TI.com/isolation. Download the ISO224 data sheet. Simplify design of the system-level diagnostics with the application note, "ISO224 fail-safe mode." Explore the application brief, "ISO224: ±12-V input, next-generation reinforced isolated amplifier for voltage sensing," to learn more about the device’s features and functionality. Watch the TI Precision Labs training video series on isolation. Search for solutions and engage with fellow engineers and TI experts in the TI E2E™ Community Amplifiers forum. TI E2E and TINA-TI are trademarks of Texas Instruments. All registered trademarks and other trademarks belong to their respective owners.